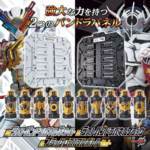 Premium Bandai DX Last Pandora Panel White, Black and Black Lost Bottles Revealed! 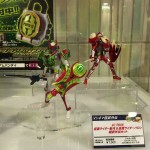 As Kamen Rider Build approaches its final episodes, new merchandise has come to light. Premium Bandai is set to release the DX Last Pandora Panel White, Last Pandora Panel Black, and Black Lost Bottles Set. These items play a prominent role in the later episodes, with the Black Lost Bottles being an important plot point. While the Pandora Panels are just repaints of the original Pandora Panel, two of the Lost Bottles are only obtainable in this set- the Hasami (Scissors) and Spanner Lost Bottles. While collectors may already have a majority of these Lost Bottles in their original silver and purple color scheme, this black and gold set is a perfect opportunity to obtain the ones that are harder to find, such as Kuwagata and CD. The set is now available for preorder, priced at 8640 yen with a January 2019 release date. As the years go by and Tokunation grows, we have made many featured articles, galleries, and changes to help connect to the tokusatsu fan community. With this being Tokunation’s sixth year being live, as well as the one year anniversary of our Customs Corner segment we here amongst the staff have decided to make a special showcase gallery of our works! Dive into the gallery to see the customs of our very own Den-O, Sentai Tamashii, Kiryu, KamenRiderOOO and ZeoRangerV and take a read at how they created their pieces in this discussion thread! From Minipla to custom S.H. Figuarts to a Gundam, there is no shortness of unique customs! We hope you all enjoy what you see and thank you all for your continued support! Be sure to give them all follows on their Twitter pages; @DenO_Tokunation, @SoulinkChu, @DK_Zer0, @TrueKROOO and @Ajax_Ranger! As each year passes, we reflect on how we are currently missing out on a big part of collecting- Sentai Figuarts. With only a few teams released, and not many of them even complete, the only way to even get some made is to commission someone to make them or make them yourself. This month for Customs Corner, we take a look at a customizer with an affinity for Red Rangers/Red Senshi, Red5/ReddoFive! 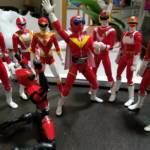 One of our own members here on the forum, he makes Red Ranger/Red Senshi Figuarts, creating Reds from both past and current teams, such as Ninja Red and AkaNinger. Be sure to click here to discuss! Follow Red5/ReddoFive on his Twitter! It’s that time of year again when everyone starts getting their costumes together! Oh wait, typo, I meant Customs together! This month we sat down and had a talk with one of our very own members, Nrin Vakil, also known on his other social media accounts as ZordBuilder! In addition to sitting down for an interview, he has decided that Tokunation is the perfect place to unveil his fully assembled Dino Force Brave Team with accurate dinosaur helmets! We are honored to be the ones to premiere these customs, as they look positively amazing! Also featured in this article is some of his custom zords, such as the Futabasaurus Zord and the Tupandactylus Zord, as well as a team of Rangers based on Ammonite, Archelon, Futabasaurus and Fukuiraptor! Be sure to click here to discuss! Follow NrinVakil/ZordBuilder on his social media accounts, such as Twitter and Facebook! Just like Nickelodeon and Power Rangers Ninja Steel, Customs Corner comes back from a month long hiatus. 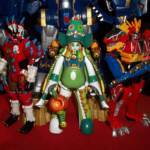 Where we last left off, it was March and we had seen Grimlockimus’s large-scale project- the Original Color Movie Megazord. But while many enjoy the large scale items, what about the smaller scaled ones? 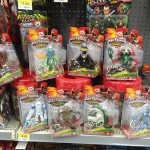 What about the Ranger Keys or the Bandai of America Ranger and Monster figures? Well, look no further than one of our site member’s works! This month’s featured article is on ZeltraxMillenium, an old acquaintance of mine and a fellow customizer. Here, you can check out his gallery of past works, as well as read up on his interview in the discussion below. Be sure to give him a follow on his Twitter account, @ZeltraxMilleniu! January featured the Figuarts of King Ranger. February featured the Figmas of TheScreamMan. This month, we feature what makes a Power Rangers series different from other live action hero shows- giant robots. People dig giant robots. And what better way to count down to the Power Rangers movie premiere with a look at the perfect What-if paint job- What if the Zords retained the classic color scheme and look? Thanks to our very own site member Grimlockimus, this what-if has become a reality. 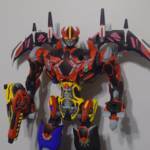 We are proud to present his very own custom Power Rangers Movie Megazord, with some pictures he has graciously taken to be exclusive only to Tokunation. We hope you enjoy this masterpiece as much as we have, for we were blown away by the paint job and modifications he has made to it. Now let’s go. Go into this thread to read his interview with us. Click here to see his Tyrannosaurus Zord thread, here for his Triceratops Zord thread, here for his Sabertooth Tiger Zord thread, here for his Mastodon Zord thread, and here for his Pterodactyl Zord thread. Be sure to give him a follow on his Twitter account, @ChromeTyranno! 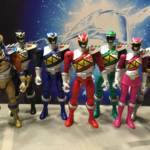 Last month, we featured King Ranger, master of Super Sentai Figuarts customs. Now we’re about to take a look at another figure spectrum- Figmas. When S.H. Figuarts Hana (19 years old version) was released back in 2009, many were hopeful more Kamen Rider civilian characters would have Figuarts, or at the very least the Riders themselves would be made. As time went on, we never saw anything similar, bar customs made by people using Figma bodies. This month, we feature one such customizer- The Scream Man from Twitter! Click here to read his interview, as well as view some of his custom Kamen Rider civilian Figmas! Be sure to give him a follow on his Twitter, and listen to his Podcast! This month’s focus is considered one of the greatest customizers around. From his work with various custom Super Sentai/Power Rangers Figuarts to his new prop-making work, this person is well-known for his masterpieces and an inspiration for those who are entering the field themselves. His most popular piece is also a favorite of site owner Kickback and also the character he takes his username from. The customizer we focus on this month, is none other than King Ranger. Read his interview in the corresponding thread, as well as view some of his previous works down below and be sure to give him a follow on his Twitter, Tumblr and Facebook pages!